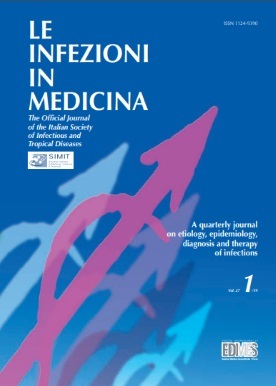 "Le Infezioni in Medicina" is a peer-reviewed quarterly journal which publishes, free of charge, reviews, original articles and case reports on experimental and clinical investigations concerning any aspect of infectious diseases. A special section is concerned with historical aspects of infectious diseases. 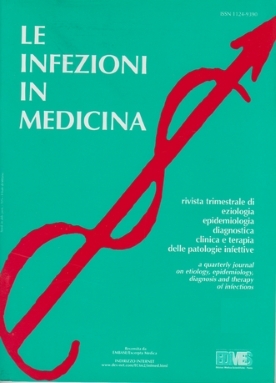 "Le Infezioni in Medicina", first issued in March 1993, is published in Italy and the official language is English. The logo reported on the coversheet is the ancient alchemic symbol representing in 15th century the process of purification. The Editorial Board includes many outstanding infectious disease specialists and clinical microbiologists from most part of the word. All manuscripts submitted for publication, are peer reviewed for their clinical relevance, technical accuracy, clarity and objectivity and, if accepted, are shortly published. Contributions from all over the world are welcome under the only criterion of scientific quality.